The need for special education school's came about when student's required support that goes beyond that which is normally offered or received in the regular school and classroom setting. Special needs include challenges with learning, communication challenges, emotional and behavioral disorders, physical disabilities, and developmental disorder, students with this kinds of special needs are likely to benefits from additional services. Special Education includes a range of support services, depending on the special needs of the student. Support services involve Physical assistance and therapy, Counselling and Psychotherapy, Modified learning environment and assistive learning devices, educational and psychological assessments and behavioural Modification techniques. WHO NEEDS THE SPECIAL EDUCATION? This group consists of children between 3-6 years of age. The coverage of content in the areas of personal, social, and academic is more than with occupational area in this level. 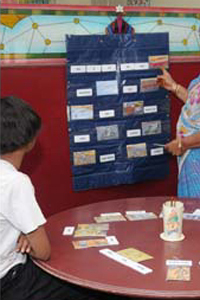 Primary - II : The students who do not achieve 80% of the items in the checklist in Preprimary level even after 8 years of age are placed in Primary - II. The content in the academic area is minimal for this gorup. This group covers children from 8-14 years. When they achieve 80% of the items in the Primary - II checklist they are promoted to Prevocational - II. In some cases they may achieve 80% before the age of 14 years and may be promoted to Secondary gorup. Both the groups consist of students in the age group 15-18 years. The primary focus of training is on preparing students in basic work skills and domestic activities. Hence the major content covered in the checklist area in the areas of occupational, social and academics. However, the content coverage under academic area will be minimal or need based for Prevocationa - II group of students. A primary purpose of Special Education is to help students with disabilities lead succesful and personally fulfilling lives now and in the future. Curriculum for students with special needs is designed to prepare students to function as independentaly as possible in an integrated society.